The last morning on the Danube Waltz cruise came very early. Our departure point, the Munich Airport, requires a drive of about two hours. Viking sent us off with a pre-sunrise breakfast for those leaving in the wee hours. Our luggage was waiting on the dock, so we were reassured that ours would be loaded on the bus. Once at the airport, we made our way back to the states filled with memories of a cruise that far exceeded expectations. One can usually list a vacation’s most outstanding features – – the sites, the food, the history, the culture, the music. Not so with Viking, they gave you all, equally abundant, varied, enticing, enchanting, and truly memorable! Overnight flights leave most travelers tired and groggy, a feeling I experienced upon arrival in Budapest. Clearing customs quickly, my travel partner and I met the Viking Cruise representatives at the baggage claim exit. They escorted us to a bus that delivered the group directly to the Viking Vilhjalm docked on the Danube River. The mighty waterway, famous for the Straus waltz, splits the enchanting capital of Hungary with Buda on one bank and Pest on the opposite side. We retired for a brief nap, slipping into soft white linens and a slew of pillows. The Vilhjalm’s 205-square-foot Veranda Stateroom made for a bright, sleek and clean refuge. Oak veneer surrounds, a large mirror and 40-inch flat screen TV dominate the far wall. One counter section fashioned into a vanity area offered a stool, while the opposite end houses a mini-refrigerator. Another chair sits beside the double bed. The bathroom, small as expected, proved quite workable. A shelf below the sink can store toiletries and two cups were attached to the wall. The shower pressure proved excellent. Not only can you control the room temperature; how about heating the bathroom floor! The Vilhjalm docks at the ultimate riverside landing on the Danube River, the first boat directly below the iconic Chain Bridge. The awe-inspiring Buda hillside commands attention, not just beautiful, but witness to more than a thousand years of history on the very spot. Castle Hill, Fisherman’s Bastion and the Gothic church spires that soar above are a constant lure. Viking offered a 45-60 minute walking tour, but we couldn’t wait to get reacquainted with the city. We took a serendipitous stroll to nowhere in particular. Little shops ,chockablock with souvenirs, street side cafes, and appealing Art Nouveau buildings dotted the streets. The hint of spicy aromas filled the air, as did the melodic sounds of a busker playing the violin. We wandered into St. Stephen’s Basilica, with its wealth of Baroque design. The massive domed building looks older, both inside and out, than its 1905 construction would suggest. We returned to the boat for a welcome party, champagne toast and information session. Joe, the Cruise Director, reviewed the schedule for the following day and answered all questions. A relaxing dinner in the main restaurant followed featuring, of course, the national dish of Hungry, Goulash, and options that included Ahi tuna. Staples like rib-eye steak, chicken, and burgers are always available. The food preparation and presentation rank on par with high-end restaurant fare. No, not Michelin star pizazz, but cooked by a serious, competent and attentive chef. Forgoing after dinner coffee, we headed to the top deck for the gorgeous sunset – – a stunning backdrop to the sights on the hills of Buda. Soon, dancing lights waltzed over the Danube, beckoning all to the Sun Deck. The Viking Vilhjalm offers million-dollar views – – nearby landlubbers gathered on the Chain Bridge to share them. By bridge or boat, the illuminated splendor of the Buda hillside is unforgettable. There is little to argue with those who call the panoramic scene the most splendid in the world. ABOARD THE VIKING VILHJALM…Budapest has well earned its nickname of “the Pearl of the Danube.” The Danube River waltzes through the city core, dividing the old city on the west – – Buda – – and its younger sibling – – Pest – – on the opposite bank. Viking justly named its river cruise the Danube Waltz, accentuating the river’s music with a daily complimentary tour and a variety of optional excursions. Before the Vilhjalm reached Slovakia, the Longship needed to pass through a series of modern locks, the first one the largest. The locks are new – – Stalin didn’t want to open the Danube as an escape route to the west and freedom. Progress was like watching grass grow. Way too slow to keep the attention of most. Viking offered an educational video to explain the process and views of what goes on in the wheelhouse – where and how the captain steers the vessel. ABOARD THE VIKING VILHJALM …The Hapsburgs ruled the Austro Hungarian Empire from Vienna using their fortune to build Baroque palaces, churches and museums across the city. Those buildings form the core of what is now a UNESCO World Heritage site. Vienna’s rich history and culture continue to dance – – like its famous waltzes – – sweeping you in and maintaining your interest. My Viking Danube cruise provided a day with many opportunities to touch and taste the capital of Austria. Viking ’s complimentary panoramic tour takes passengers via bus into the historic city center for a walking tour. A Close-Up Tour does the same, substituting the subway as transport. My travel partner and I chose the subway tour, wanting the less regal, more down-to-earth sense of this grand city. Lucky us, we were the only two to choose this tour, ending up with a private tour guide. Doesn’t get much better than that! We could ask the questions we wanted and vary the itinerary according to our desires. Nowhere is the combination of aromatic coffee and sweet chocolate cake more famous than Vienna. My wish- – a stop in the Hotel Sacher for a piece of their famous Sacher Torte. Wish granted at the Sacher coffee house instead of the main hotel — same cake; a delightful Viennese way to relax with an espresso! Sacher Torte, a luscious combination of chocolate cake layers spread with apricot jam comes encased in thick, deep dark chocolate frosting. A dollop of whipped cream on the side complements the slightly bitter and not overly sweet chocolate. After my treat, we walked toward the enclave of Hapsburg buildings, taking in the architectural highlights. A stop in the Augustinian Church (or St. Augustin) brought us to the site where many royals married and were also partially buried. Marlise, our guide, explained, “The bodies of the Austrian Habsburg emperors are each buried between three Vienna locations; their entrails in the crypt of St. Stephan’s Cathedral, their bodies in the crypt of the Capuchin Church, and their hearts in silver urns in the Loreto Chapel of the Augustinian Church.” The joke is the Hapsburg’s don’t rest in peace – – they rest in pieces. A slow stroll past behemoth statues and monuments, brought a wealth of information about the monarchy, politics, wars and specifically Franz Joseph and Sisi, his wife who is often compared to the late Princess Diana, Eventually we made our way to St Stephen’s Cathedral, topped with it’s a massive reconstructed Gothic spire rising above all. World War II ravaged the structure, now fully repaired. We were set free to explore inside the church at our own pace before meeting up for the subway ride back. We learned much and truly enjoyed our private tour, adding detail to the basics we had learned on a previous visit to the Austrian capital. Thanks, Viking. The afternoon brought a behind-the-scenes tour of the Lipizzaner Stables. The Lipizzanners, a renowned breed of white horses, get their training at the Spanish Riding School of Vienna. Nothing new, the Spanish Riding School celebrated its 450th anniversary in 2015. To perfect the difficult equestrian maneuvers, the matched rider and horse train anywhere from 8-12 years before performing in public. No photos allowed in the stables, but afterward, I captured one with a long lens from an exterior window. The large horses show amazing muscular development. Dark in color at birth, the foals only gradually turn white as they age. Our excellent guide explained that there are three branches of the Spanish Riding Academy. Piber serves as the breeding and birthing ground. Young stallions go to the second, the Heldenburg training center to begin their training. This center also serves as the vacation sport where performance stallions spend six to eight weeks in summer. Retirees spend the rest of their lives at Heldenburg. 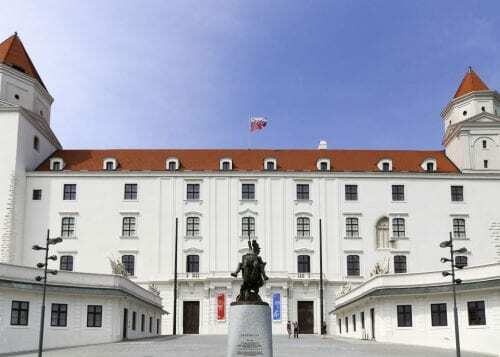 The third branch is the “haute ecole” or high school where rider and horse train in Vienna. It includes the fabled performance hall decked out with crystal chandeliers. The tour included the tack room, full of various items of gear, including the performance sets. The guide explained how they were made, and adjusted. A visit to the training ring offered got a peek inside the performance hall from a horse’s point of view. If only we could have seen one do a few maneuvers, but you have to go to a show to see that. Apply for tickets well in advance. Back onboard, my full day continued with an early dinner arranged for those of up who signed up to go a concert. 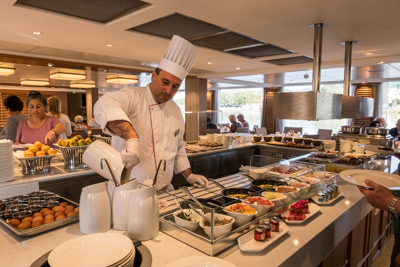 Usually, Viking River cruises offer just one dinner seating. We followed dinner with a return to the city, to hear the Wiener Hofburg Orchestra. The Mozart- Strauss performance proved better than expected, including two opera singers and two dancers. We heard Strauss waltzes and selections from Mozart’s The Magic Flute—music that has defined this magical city. I’d call the repertoire more lighthearted, but entertaining. 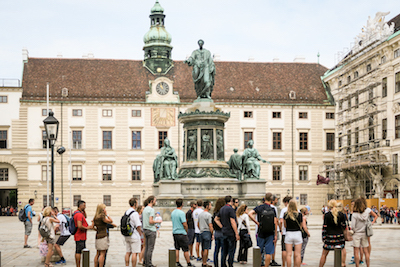 Viking offers a full range of morning, afternoon and evening excursions so you can see and do as much of Vienna as possible in your short time there. ABOARD THE VIKING VILHJALM …Early in the morning, my Viking Longship arrived in Krems, a small Austrian village on the banks of the Danube. Red roofs, a bulbous turret and a yellow clock tower rising above the town greeted us. Believe it or not, one of the joys of this tour was the bus ride. We passed through towns so tiny that the narrow roads just barely allowed the bus a little “squeeze” room. Other fairytale-like villages and ruins of castles dotted the opposite riverbanks and clung to its dramatic hillsides. Our guide’s insightful explanations offered an understanding of the area that would come in handy during the coming afternoons’ cruise. Crossed a bridge we rode uphill to mustard-colored Melk, standing high above the Danube. Here, we joined an official abbey guide, passing through chronologically arranged rooms tracing its history. Because of its proximity to the royal court, the monastery built extensive royal apartments – seems like the monarchy must have had its own early hotel chain in these parts. Of course, a banqueting room was also necessary. This hall’s columns looked like marble, but were faux, painted to look like the real thing. The ceiling fresco too fooled the eye with trompe l’oeil effects giving the appearance of great height. The library remains Melk’s foremost treasure, its lined floor to ceiling with dark bound volumes. The 100,000-book and manuscript collection includes a ninth-century manuscript, rare collections and lots of gold accents. The abbey owned a copy of one of the original Gutenberg Bibles, but it went to Yale in a sale to fund needed roof repairs. The afternoon cruise on the river proved one of the best on the entire cruise. The 18-mile, slow journey across the Wachau Valley meanders through a UNESCO World Heritage landscape site. Lovely to sit back and sip the local wine while seeing the combination of terraced vineyard slopes, dry stonewalls, hillside castles, and riverbank villages. 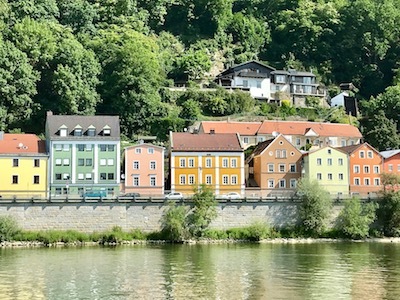 ABOARD THE VIKING VILHJALM… Today’s adventure takes us to Cesky Krumlov, slightly more than an hour and a half away from Linz, Austria where we are docked. Cesky Krumlov rates just a small and meek dot on the map of the Czech Republic – – politically inconsequential. But she’s a mighty tourist cauldron, simmering a mixture of Medieval, Renaissance, baroque and rococo in a rich pilsner beer broth. And the kettle bubbles over. I first visited Cesky Krumlov eleven years ago and loved the little red-roofed hamlet encircled by the Vltava River. No cars allowed on the cobblestone alleys and bridges that course around medieval townhouses like a maze. Back in the early 2000s, the UNESCO World Heritage site was sadly fraying, bursting at the seams from a deluge of visitors. I am thrilled to report renovations and a hamlet that seems to be on the rise, likely due to UNESCO’s support and the Czech Republic becoming part of the European Union. Our guide told of the families who ruled the Moravian village – – from the Rosenbergs to the Schwarzenbergs. The Rosenbergs, ranked among the most powerful aristocratic families in Bohemia, their members repeatedly holding the highest offices in the land. Cesky Krumlov passed to the Eggenbergs who held it until 1719. Later, under Eggenberg rule, castle and townhouses were remodeled in the Baroque style. Then the Schwarzenbergs took over until 1947. The last important changes, by the Schwarzenberg family, came in the second half of the 18th century. 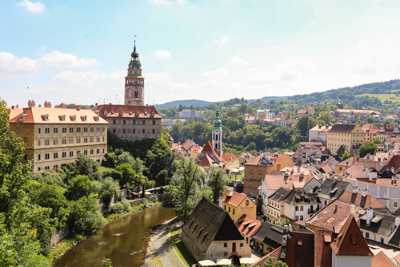 Since then Cesky Krumlov has preserved the romantic atmosphere that attracts many tourists every year. The decorative painting on the exterior buildings surrounding the upper courtyard had been repainted since my previous visit- an excellent touch. We came to the main castle courtyard, and then we crossed the drawbridge over a pit where, until recently, two brown bears lived; one has died. Since the 16th century, the bears have provided the protection usually offered by water in a moat. They also symbolized a link with royalty. It seems the castle owners added a bear motif to the coat of arms to flaunt their relationship to the “Orsini” line – a noble Italian family. “Orsa” means she-bear in Italian, so they began keeping the real deal. Beyond the castle, jewelry shops, souvenir stands, and cafes line the narrow alleyways. They lead to another bridge and up toward the main town square that swarms with bedraggled backpackers, a thick potage of the camera frenzied, a smidgen of European families and we cruisers. After our tour, we found a restaurant behind a hotel alongside the river and ordered wood-grilled local specialties and a refreshing pint of Eggenberg beer. The cool brew did nothing to damage the well-earned reputation of Czech beers, beating an early heat wave in June. We meandered around, zapped of energy, deciding to skip the climb to the castle tower. Unfortunately, the museums are closed on Mondays. Raft tours on the river coursing through the city’ are wonderful, but I didn’t find them open either. No matter, more angles for delightful photos hid behind corners, stairwells and perches until we met up with a couple from the cruise for another refreshing drink. Cesky Krumlov is a photographer’s delight, a fairy-tale village that rightly attracts and pleases. 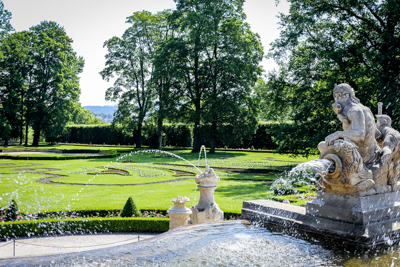 If you take the Viking cruise, be sure to add the excursion to this Czech masterpiece. ABOARD THE VIKING VILHJALM …The morning we arrived in Passau, I was suffering from allergies. Perhaps the beautiful flowering trees had upset my equilibrium. Rarely sick, I was sneezing like crazy, felt rotten and decided to spend the morning in bed.